We here at Alienworks wish you all a safe and happy holiday season! Our end of the year update is a little bit shorter than usual, but not without content! The main question I assume people are wondering about is the new demo. We’re still working on it (I know, we’ve been saying that for several updates now), we just underestimated how long it would take us to finish. As we’ve mentioned before, full-time jobs and other obligations take up a hefty chunk of everyone’s time. The good news, though, is that the assets being used in the demo are mainly assets that will be reused in the rest of the game – primarily sprites and backgrounds – which means that once this initial hurdle is over with, there will be fewer unique assets that need to be completed for the rest of the game. Writing for the routes is still going on well, and the soundtrack rework is in-progress. In fact, you can check out a new draft of one of the character themes, which was actually completed while I was writing this update! Can you guess which character it’s for? We’re not really gonna give another specific estimate for when we think the demo will be done, since that’s backfired on us more than once now, but we mean it when we say it shouldn’t be too much longer. Nearly all of the assets for the demo are done, and it’s mostly a matter of some final editing, and then implementing everything into the engine. We appreciate your patience! To go along with today’s update, we have a cute new art piece from Myuto. 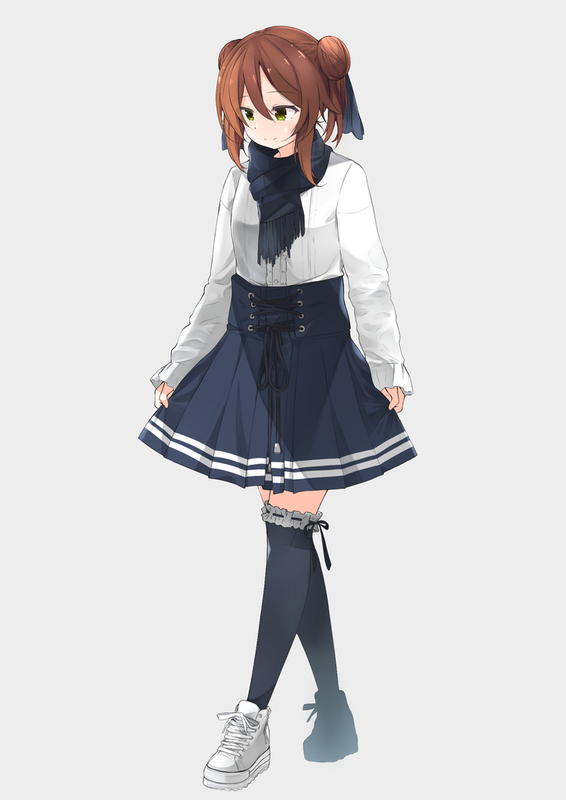 It’s another one of Kaede, Yukino’s sister, this time in a fashionable Winter outfit. Next, we have one more version of our opening theme, “REIGNITE,” which will be sent out to backers later today. It’s a version of the track with English vocals, performed by the immensely talented Jubyphonic. Be sure to check out her Twitter and Youtube channel! You can download the track via Backerkit, same as the other versions. Additionally, both the original song and the James Landino remix are playable in the mobile rhythm game NeonFM, so give it a play on there if you’re into the game! That about wraps things up for this year. Just below, we’ve included some special messages from a few of the team members again, so please give that a look. Otherwise, thanks for all your support and patience this year, and we look forward to seeing you guys in 2018. PS: If you were wondering about Highway Blossoms: Remastered, we’ve got some relatively good news. While that won’t be out by the end of this year, it WILL be out early next year. Voice acting is almost finished being recorded, with only one or two sessions left. Syon’s been working really hard with our voice director John, as well as the actors themselves, and have done a stellar job. The voicing adds a lot of life to the game, and we think you’re gonna love it. Plus, we’re also improving the rest of the game, with touch-ups to the music, art, and even some of the sprite directing. If you haven’t picked up Highway Blossoms yet, now is a great time to do so, since it’s 75% off on Steam for the sale.